Note: I’ve been meaning to post this for a few days, and in frustration with the picture embedding I have failed. So…this post is a little dated. Sorry! This weekend has been great, even though my husband has been out of town. A weekend that could have been not-so-fun turned out to be quite lovely. One of the great things about living in Nashville is that everyone you know is super talented. Another great thing about that is that sometimes you might be in the right place at the right time and get to do something cool with those talented friends. Some of my friends from Belmont are in a group called Mosaic, and they’re in the middle of recording their 3rd album. They are 6 very talented individuals and they all do different things really well, so their group is really unique. Anyway, they needed some people to do gang vocals on a few of their songs Friday evening and I was lucky enough to be invited to help out. It was really fun to be a part of! I’ve been in studios a handful of times, but I’m never one of the people on the other side of the mic, plus I have an affinity for gang vocals. Somehow a large group of people singing a simple phrase over & over tends to make that phrase sound more epic to me. So I really enjoyed doing it. I can’t wait to hear the whole album when it comes out! Also my best friend from home, Noelle, came up to visit/keep me company this weekend, which was super fun. I got to hang out with her and my other best girlfriends in town Friday night. It’s great to have friends with whom you don’t need to plan any particular entertainment, you can just hang out and talk for 4-5 hours. 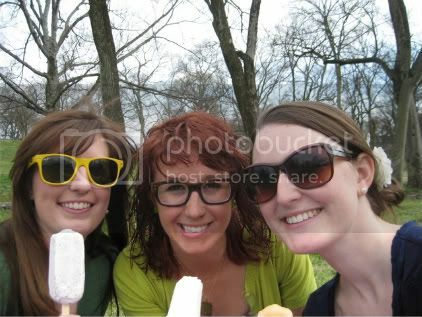 We got to enjoy the weather Saturday eating lunch outside at Baja (yum) and then getting Las Paletas (gourmet popsicles) and hanging out at Sevier Park. 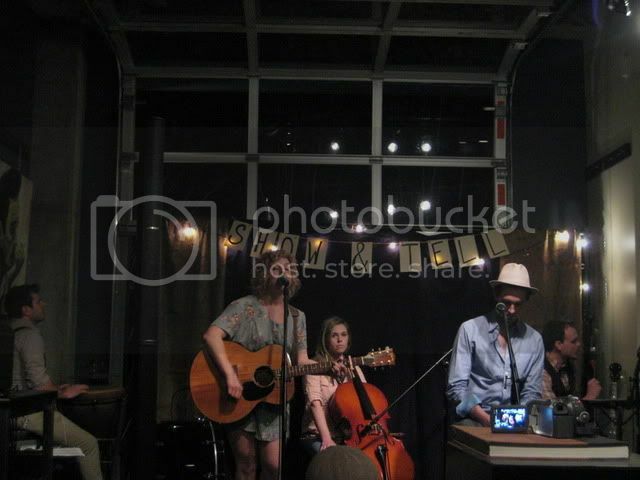 That night, we headed over to Ugly Mugs in East Nashville for some good coffee and free music. I really loved Ella Sinclair’s set! She’s a great songwriter. She gave away her cd at the show and I’m excited to keep listening. Check her out! Also file “free great music” and “wonderful coffee shops” under Reasons I Love Nashville.